MotoGP 10/11 will bring fans the most authentic and realistic MotoGP experience of the series so far. 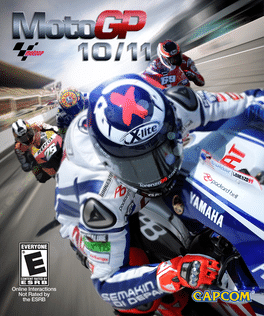 Gamers will get all of the 2010 MotoGP season content and downloadable updates for the 2011 MotoGP championship shortly after the season starts. The all new handling system and improved physics in MotoGP 10/11 will deliver a level of authenticity never seen before in the GP series. The inclusion of the brand new customisable player assists feature allows fans of both simulation and arcade racing to alter their racing style. Those wanting to take less of a risk with their riding technique will be able to switch on the player assists for a more forgiving style of racing. 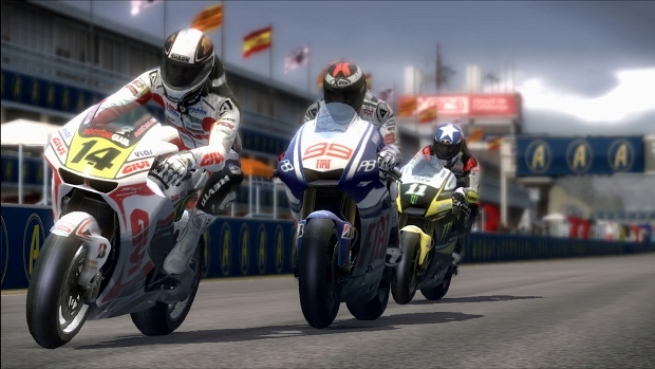 For players who want to feel the full intensity of MotoGP racing, all the in-game player assists can be switched off, delivering challenging and realistic gameplay that emulates the MotoGP experience. ‘Career’ mode will be complimented with the addition of brand new co-op play. Through local splitscreen gameplay a second player can jump into the race and become a team mate, helping to take your team to pole position. The classic ‘Championship’ and ‘Time Trial’ modes are back along with a revised ‘Challenge’ mode. This year fans of the MotoGP will be able to play as their racing hero from the start in all three of these game modes. There are far more images available for MotoGP 10/11, but these are the ones we felt would be most useful to you. If you have specific requests, please do contact the developer!